Serious, long, drawn-out conversations have been happening over here- both in my head and in my home. Sample topics on the table: Vacation, fear, jobs, anxiety, futures, travel, music, sewing, among other things… And of course there have been proper amounts of joking thrown in for good measure because I’m finding it’s waaaay less messy to laugh than cry. Unless laughing hard makes you have to seek out the nearest ladies (or men’s) room in which case I’m sorry and maybe that’s not an entirely true statement. My people have learned you have to keep it light and funny on the serious stuff because this gal spooks easily. At any rate after weeks of feeling harried, rushed, trapped, frantic, anxious, unfocused, and a whole host of other emotions (when I go I go all out y’all…). There has been a hard stop. A rest of sorts. A calm. An understanding and a letting go. And this is a-ok with me. I’ve been trying to do it all and the fact of the matter is I’m not doing any of it well. So after lots of praying and talking it out, we decided I’m not going to take on any new sewing jobs for a little while or push for new streams of income or drive myself batty trying to list things on Etsy or find shows to do. I’m just going to breathe. Slowly. Deeply. Unhurriedly. I’m going to drop back to first gear. Hi, my name is Heather but you can call me Martha. Thinking more about names, I decided to look up what each of their monikers meant. 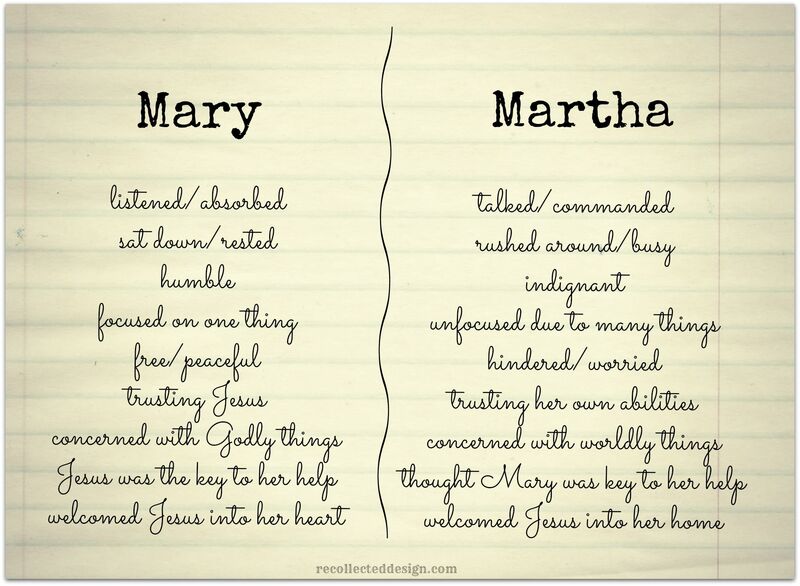 Mary = wished for child and Martha = lady or mistress of the house. Even their names sort of fit. Mary seemed to come to Jesus in a child-like way while Martha took the grown up role of orchestrating all.the.things. Now, it’s not to say that Martha didn’t also – in slower moments – sit at Jesus feet from time to time. I’m somehow convinced she did. But this snippet of their story seems made to illustrate a greater point. Imagine Jesus coming to a Thanksgiving dinner… that takes place at your house… where you have to cook. Have you ever tried to prepare the turkey and all the trimmings by yourself while maybe the men folk are otherwise engaged by the tv or flag football… ever forget the cranberry sauce or the yams? Or ended up with two dishes ready, the turkey drying out and 3 more to finish cooking because for gosh sakes you’re only one person with one oven not counting the toaster and besides the potatoes wouldn’t fit in there anyway. Except Jesus said, in effect, only one dish was needed (Unless there’s pecan pie and then all bets are off…my words not his…) which is fellowship with Him- rather than the umpteen side dishes of good works that we do to try and impress or the copious amounts of desserts that could represent our attempts at our own will being done rather than His. Just one dish y’all. And Mary already had it. In light of that, I really want to be a Mary. And the key lies in sitting at His feet. Guard down, mouth shut and hands up. Even after mulling all this over Friday I still found myself mopping the floor Saturday in a scramble when I was reminded to slow down. So we talked some more and I told the husband I wanted to sing more… Sew less. Play more music with the boy…Pay less attention to what kind of business everyone else is about. 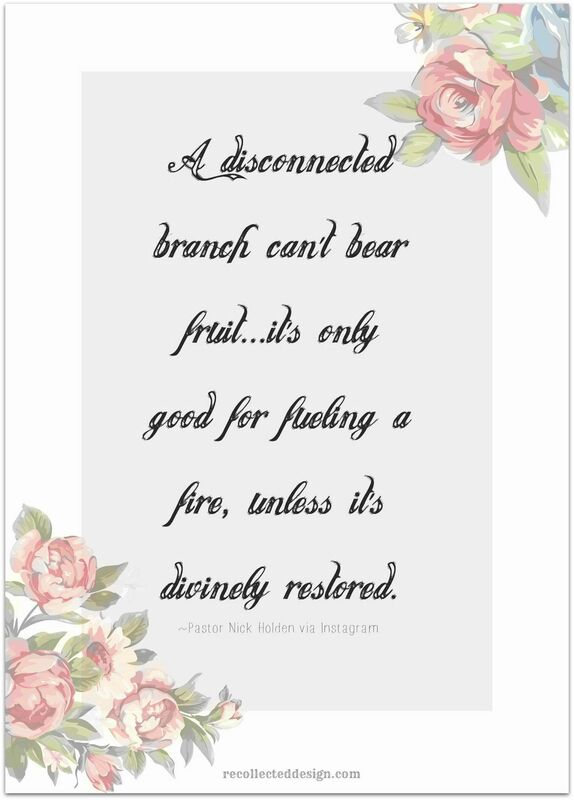 Forget the email exchanges that lead to nothing and the self promoting that makes me feel selfish… Focus on God and the love of music he planted in me that’s been overtaken by all the weeds. And he was a-ok with that. So in that vein, we resurrected our dream of visiting music city in the fall. It’s not only rooted in country but the Christian music scene has sprouted there too. And for folks like us who somehow find ourselves owning large amounts of stringed instruments, we’ve always been drawn to that place like a moth to a flame. Whatever happens, God is in control. He forgives me for my Martha moments and shows me how to live in a more Mary-like manner. I can’t wait to see what He prepares while I sit at His feet. P.S. Looking for more Mary and less Martha? Or just a little more meaning in the mess? It’s my pleasure to create connection, community and sometimes cute stuff just for you! And I’d love it if you’d join our little tribe. Click right here to get the scoop and a set of printable scripture cards! Looking forward to chatting with you soon. Thanks so much for being here. Hello Valerie!!! How I missed your comments here last week! Thanks so much for your encouragement and lovely thoughts as always. I’m so glad that someone else ‘gets’ these things that rattle around in my head : ) ♥ xo I can’t wait to see how God moved for you in your most recent adventure! “The key lies in sitting at His feet. Guard down, mouth shut and hands up.” Umm, yes. That’s exactly it, simple and straight to the point. I love how the Lord made the old passage new to your heart, meeting you right where you were at. Sounds like He is preparing you to sit and soak Him in…and that of course is the most soul-satisfying place we can be. …so glad to be your neighbor at Holley’s place today. Thanks for your sweet comment Becky and for stopping by! xoxo At His feet is a sweet place indeed! Blessings on a great day for you girl! Hey Sweetie! I would like to be more like Mary too! I’m not sure what I would do more of….because I surely cannot sing or play music with the boy like you can! BUT maybe I could just listen to you sing & play music with the boy more!!! (I am excited that I will get to hear you this Sunday when Mizmor 96 leads the music at church. Those Sundays are so special!). Life does get too busy at times and we forget what is really important. Thanks for reminding us. Love your blog and love you! You are blessed to have a husband that encourages you to slow down and sit at Jesus feet. The new list that the two of you drafted is wonderful, fulfilling, and family focused. God is pleased.